A square pyramid with base and vertex has eight edges of length 4. A plane passes through the midpoints of , , and . The plane’s intersection with the pyramid has an area that can be expressed as . Find . I didn’t think this method would turn out bashy, but it was. Oh no. Now we have to intersect that with and to see what the other points are that bound the figure whose area we have to find. First, . The vector , and , so , , and . Plugging in those values for the equation of the plane, we get that and intersect when , or at . We’ll call that point . Similarly, and intersect at . We’ll call that point . Now, time to find the area of . 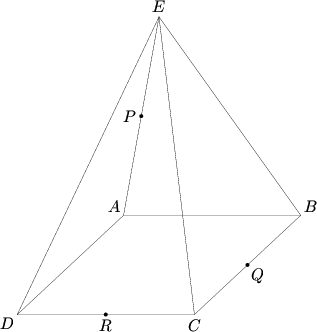 This divides into 1) an isosceles triangle with lengths , , and , and 2) an isosceles trapezoid with parallel lengths and , the other sides both being . Some “intense” calculations reveal that the area of this is , so the answer is . Let’s see if we are . We’re right! And both solutions mentioned use coordinates, just as we did. Theirs had less calculations, though, finding the height of the triangle a much faster way (I guess). Ok, it seems shorter the way they did it, but I think they pretty much did it the same way. I would call that a win. Coordinate bashing problems are the type that I could kind of do, but I don’t like them, as they don’t inspire any sort of creativity. I hope the next problem will be more clever.